Posted by admin in activity reports, eruptions, Eyjafjöll, Iceland, volcanoes. Overall, ‘More explosive activity and ash production than was observed yesterday. Progression of the lava seems to be slower than yesterday. Presently there are no indications that the eruption is about to end’. 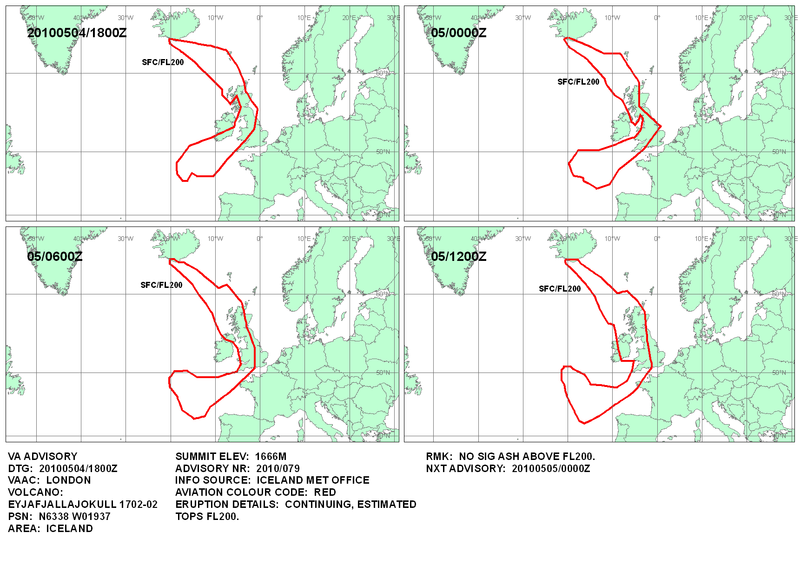 Further airspace closures over the British Isles will take effect tomorrow because of the continuing presence of dangerous levels of volcanic ash from Eyjafjallajökull (click here for London VAAC ash advisory issued at 18:30Z today, in graphic form). At present the closures are planned to affect Scotland and Northern Ireland, but as the ash moves east and south other parts of Britain may be affected. Here is a link to the IAVCEI RSC web page for the Eyjafjallajökull 2010 eruption. Many useful links are posted towards the bottom of this page. Tips for using and posting links via Google Translate. Some of the articles posted on Icelandic websites are written in English, but others require translation. If you want to post a link to a translated article, load the Icelandic link into Google Translate, press the Translate button and then copy the full address of the translated text from the TOP of your browser e.g.